Happy Belated Father’s Day to all the dads out there! Father’s Day here was kind of quiet – we went to see a movie, Tag, then grilled out. Only one son was home – the other was looking at new apartments, since his lease expires at the end of July and he has his ‘real world’ job now. Tag was a pretty good movie. 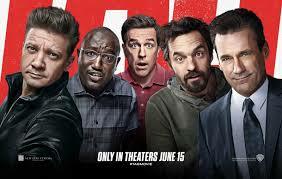 Hubby and I didn’t think it was quite as good as the reviews are indicating, but still a fun, popcorn-type of flick. And anything with Jeremy Renner is just a bonus in my book. I met some nice people at the book signing, but didn’t sell many books. Spoke with several teens and gave out some swag, then talked with an engineer about why I write and read YA books, and how he absolutely needed to watch Inception. He walked out with a video of the movie. Also discussed theories on what will happen in the next Avengers movie with a fellow Marvel fan – always enjoy doing that. Now for some more shameless self promotion! I was interviewed over at YA Books Central, and they’re also hosting a giveaway for The Gemini Connection. If you’re a YA author or reader, this is a fantastic site for keeping up to date with all the new releases, read or write reviews, and they offer tons of giveaways. I highly recommend checking it out. An excerpt of Sarah was featured yesterday on author D.G. Driver’s A Summer of Ghosts series. Her new novel, Lost on the Water, A Ghost Story, will be released July 17th and I can’t wait to read it! If you haven’t read her Juniper Sawfeather books, you’re missing out on an intelligent YA series dealing with important environmental issues. Hot and drippy humid, but a nice weekend, Staci – and you have excellent taste. Okay. I have to admit upfront that I have more computer issues than the average human. By far. (I really think I have that electromagnetic problem that makes electronics go wonky when I’m around them. I bought three vacuum cleaners last year. Three! In one year. Don’t even want to tell you how many before that.) Anyway, I tried to comment on your guest post, but my computer won’t let me. Just wanted to say how nice it is to see you touring and wish you all the best. Three vacuums must be a record! I’m thinking you have to be signed in at YABC to leave a comment – maybe? That was a fun interview at YA Books Central, Teri. Like Staci, I tried to leave a comment, but the site won’t seem to take any. It’s great seeing The Gemini Connection getting such wonderful exposure! I’m going to hop over to the other blog and check out the excerpt from Sarah. By the way, I love your author banner. Did you get that from Vista Print? I’ve been debating about ordering one. Like with Staci, I’m thinking you have to be signed in to leave a comment – could be wrong, but thanks for trying! With the banner, I got it at Printrunner – they had a much lower price and I’ve been very pleased with it. Definitely helps catch attention at book festivals and signings. Thanks. I’ll see if I can find them online! Sounds like a good weekend, Teri. Book signings can be fun even if the sales are great. Sometimes meeting interesting people makes up for it. I agree – and I had some fun talking with folks and listening to what teens are interested in. Thanks for the opinion on the movie. I’ll wait for the Red Box release. 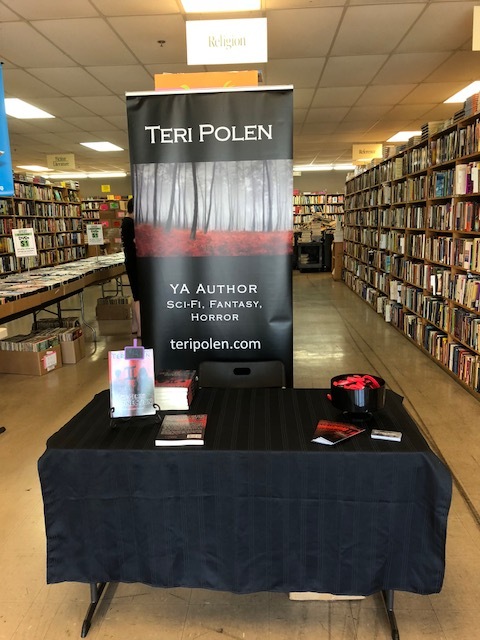 Love your book signing banner and desk colors. Looks very nice. Thanks, John – some of my favorite colors. Probably one of the colors I’ll choose for the Tesla, lol. Congrats on the book signing. That–about not selling many books–is probably why I have yet to do a book signing. Well, I did one and it was pretty much as you described! I’ve had some where I sold far more than expected, then there were some like this one, Jacqui. You just never know what to expect – but I still enjoy doing them! They really are a mixed bag, Olga. I went to a B&N that didn’t get a lot of traffic and sold out – the manager was very pleasantly surprised. Went to another B&N that never had downtime, but there was a near monsoon storm outside and didn’t sell any. Still fun talking with people. Wind River was really good – hard subject matter for sure, but completely worth watching. He did a fantastic job. Thanks, Mischenko! Yes – Hawkeye! He’s totally underrated – maybe not as much as Aquaman, but Momoa is changing that. An original superpower that comes in handy for caffeine attacks. And ‘Just keep swimming’ is my mantra. It sure was – thanks, Natalie!